An opening ceremony to the sounds of trumpets! 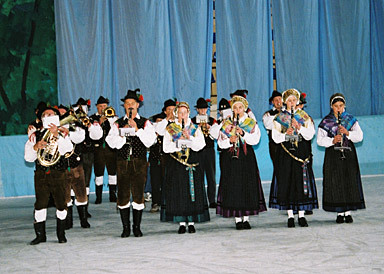 The Bled ice-rink was the setting for the opening ceremony of the 17th AEHT Annual Conference in Slovenia on October 13th 2004. Even if some people found the venue somewhat chilly, this impression soon evaporated thanks to the extremely pleasant and relaxed atmosphere, and thanks to a dignified and well-ordered programme. 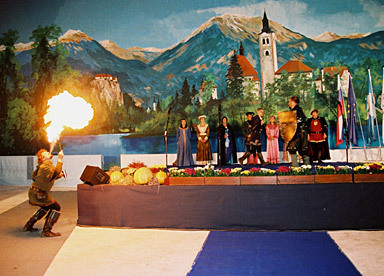 Bled’s ‘Godba Gorge’ brass band, in local costume, was lined up to accompany the entrance of the lord and his suite, noble ladies and damsels accompanied by men of arms and a fire-eater. The heralds for the event were Katja Pretnar and Gregor Silc, an amazing pair of performers who warmly welcomed the assembled delegates – more than 600 people including many dignitaries – seated on the spectators’ benches. There followed the traditional presentation of the delegations, with each national flag taking its position before the podium. This year in Bled 34 countries were present and correct: Austria, Belgium, Croatia, Czech Republic Denmark, Estonia, Finland, France, Germany, Greece, Hungary, Iceland, Ireland, Italy, Latvia, Lithuania, Luxembourg, Macedonia, Netherlands, Norway, Poland, Portugal, Romania, Russia, Slovakia, Serbia-Montenegro, Spain, Sweden, Switzerland, Turkey, Ukraine, United Kingdom, USA and, last but not least, Slovenia. Participants applauded enthusiastically as each country was called, especially for our Italian friends who each year make up about one third of the total participants. Jozé Antonic, the jovial and totally relaxed Mayor of Bled, also extended his warm welcome to all those present; he thanked the entire organising team and all the students for rising to this magnificent challenge, and expressed the wish that all the participants would return to Bled as soon as possible. Finally Alfonso Benvenuto, AEHT President, warmly thanked the municipal authorities, the School Director and his team, as well as the students, for taking on the organisation of this 17th Annual Conference. ‘I thank Bled and Slovenia for being our hosts: this is an important landmark since Slovenia is the first of the ten countries which joined the European Union this spring to organise the AEHT Annual Conference. I hope that this Conference will enable us all to share our experience, and that our students will all take part in the competitions in the true Olympic spirit. May the best ones win!’ He then ‘declared open this 17th AEHT Annual Conference’ – just like the Olympic Games. The speeches were over. The Court withdrew to the sound of trumpets, and despite the cold that was seeping through from the ice-rink, it was clear that this Conference had got off to a good start!